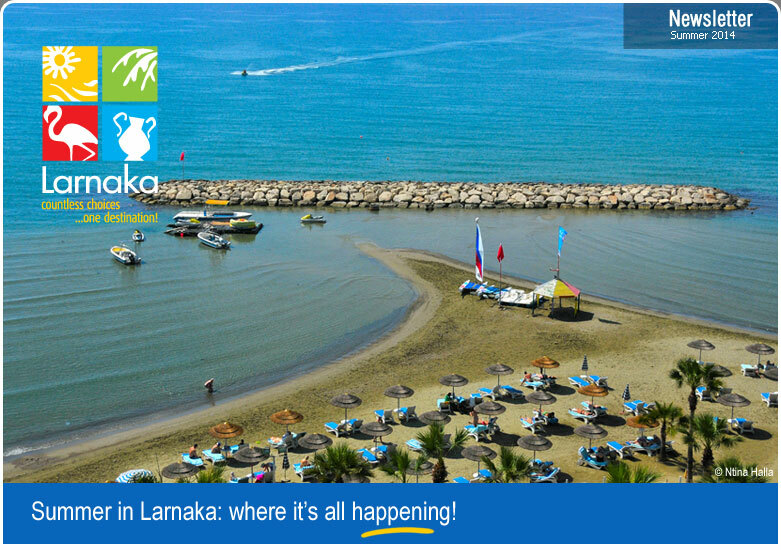 It’s summertime and as a coastal region, Larnaka was made for summer! The coasts are award-winning, the nightspots are pulsating, the atmosphere and welcome you will receive are as warm as the weather… and the event calendar is bursting with fantastic things to see, do and experience! This season, the region continues to attract sports fans with a selection of major events, including volleyball, windsurfing and SUP, whilst culturally, the annual Summer Festival is in full swing. Film fans will have the unique opportunity to watch special screenings in two historic open-air venues, and the hills are alive with the sound of music in the mountainous village of Kato Drys. Families will find the two new organised beaches convenient with their new facilities, and children are also catered for with an unusual and creative activity with sand. Add the many historic and cultural sites and villages to visit to the list and you have a complete summer experience that fills your days and nights. So, grab your sun cream and dive in, because you couldn’t be spending this favourite time of year in a better destination! The region of Larnaka already enjoys a variety of award-winning beaches with clean, safe waters and public amenities, and is now pleased to add two new organised coastal areas to the list. The two beaches are located in Larnaka villages; one in the Softades area of Kiti, and the other in Ormidia. With the enhancement of all-modern conveniences, as well as their natural beauty, both beaches promise to become very popular during their summer 2014 debuts! Larnaka is holding its annual summer cultural events over the next couple of months, which range from music, dance and theatre to traditional festivals in the quaint villages. The Summer Festival which takes place across the whole of July is always a highlight in the cultural calendar, or for an authentic island experience, take a trip to one of the region’s villages and enjoy the festivals which showcase unique customs. Sports fans are set to flock to Larnaka this summer to enjoy a series of major sporting events that make good use of two of the region’s most appealing assets - the sand and sea! With the Volleyball U21 World Championship, the King of the Kite kitesurfing championship, the first Cyprus SUP Cup, and the Beach Tennis Tournament held in the region, it is no surprise that Larnaka is considered the epicentre of summer sports tournaments! Watch the Stars Under the Stars! This summer, film lovers will have the unique opportunity to enjoy cinema under the stars, thanks to the open-air film screenings of the Larnaka Famagusta Cinema Society. The film society screens a variety of local and international films and documentaries all-year-round, and with the opportunity of the warmer evenings will screen its summer films in two stunning historical locations; the Medieval Fort and the garden of the Pierides Museum. The island’s most famous wreck dive site - the Zenobia - was recently celebrated with a host of activities under the umbrella of the first Zenobia Week. The event highlighted once again why the Zenobia ranks as one of the top 10 dive sites in the world, as well as producing stunning photographic images of the wreck through a competition. If you haven’t already visited, or don’t know about the Zenobia, read more to find out why it is so great! The picturesque and mountainous Larnaka village of Kato Drys will reverberate with the sound of music this summer during the first Fengaros Music Village, which will take place from July 27 - August 01. President of the Kato Drys Community Council Nicos Vassiliou says: "This is a significant event and we hope that the people visiting will enjoy discovering the beauty of our stone built village with its winding streets and local crafts." The Neolithic settlement of Choirokoitia, is one of the most important prehistoric sites in the eastern Mediterranean, and has been a UNESCO World Heritage Site since 1998. Under a new management plan, the site is being effectively managed for future generations, so that its insight on the evolution of human society in the region can be safeguarded. The management plan is set for five years but will be ongoing. The hilly district of Voroklini - which enjoys views of both coasts and mountains - is attracting visitors to its old water burrow that has great historic and religious significance. The ‘laoumi’, as it is called, is located at the foot of a mountain and is attributed to Saint Catherine. Its drinkable waters were believed to be holy due to a small cave next to the burrow that held an icon of the saint where the villagers would light candles in her name. Children love to play in the sand, and the Larnaka branch of the Cyprus Chamber of Fine Arts has recognised the endless possibilities that sand offers for creativity by introducing fun sand sculpture tutorials. During the tutorial, children will be shown how to use tools and the sun’s shadows to create sculptures with depth and emphasis. The main themes are figures - the human body, the face and different elements of people. Copyright © 2014 Larnaka. All rights reserved.